The new Bali 5.4 catamaran is an impressive new dream boat demonstrating luxury and home comforts for larger parties of up to 12 people. Operating from Athens, the latest addition to the Kavas Yacht Charter offers a premium choice for bareboat sailing (or skippered), around the Greek Islands. The Bali 5.4 is skilfully designed, using space efficiently and effectively, offering families and larger parties the perfect opportunity to enjoy an unforgettable experience at sea. The Bali 5.4 is a gigantic beauty - 16.80 m in length – she boasts a large walk-through area complete with tilting doors to the deck area. She has a flush-decked saloon / galley / aft cockpit area and comfortable forward deck saloon accessed directly from inside. So whether you want to take the Bali 5.4 out for a relaxing family holiday or use it as a base for entertaining or exciting water sports - it is an affordable option for fun times. The spacious forward galley has lots of storage room for those items you don’t want to leave at home plus appliances and facilities alongside a u-shaped cooking area. There is plenty of cooking space for the most discerning of chefs to practice their culinary skills and a beautiful dining area seating up to 12 people comfortably. You will be able to enjoy mealtimes using quality upholstered seating areas and roomy table, surrounded by wide glass windows with views from every angle. This space also includes a massive double door refrigerator with freezer, ice making facilities and a cold water tap as well as a dishwasher and laundry machine. 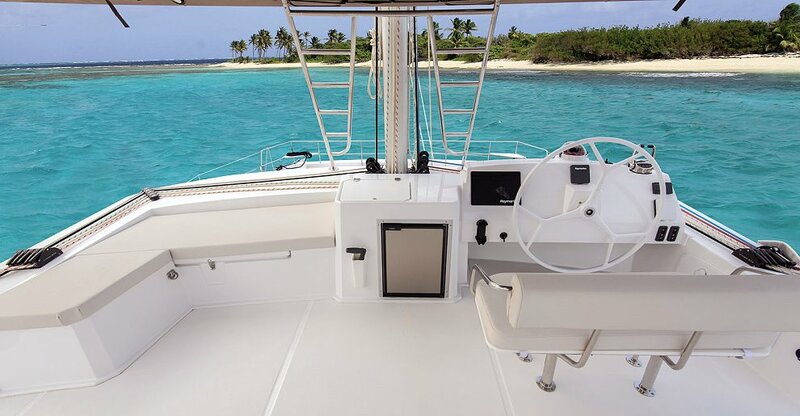 What makes the galley area so desirable is that it has a fully glazed retractable door and windows that open to deck so you have the illusion of dining al fresco which really opens up the already generous area. 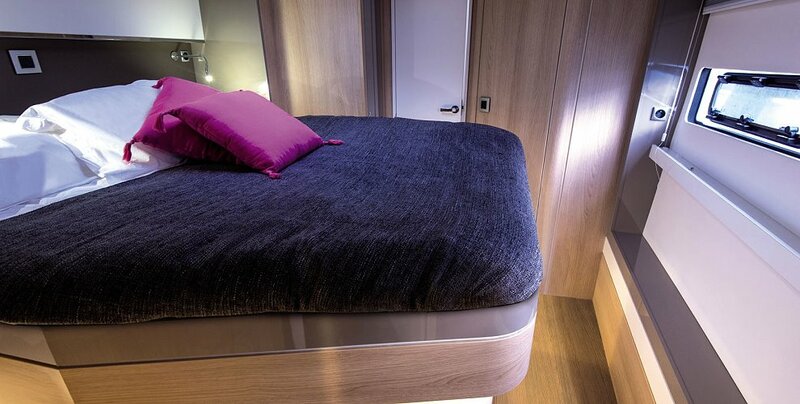 The 6 cabins on board can be divided between 4, 5 or 6 double or twin bedrooms and has a possible combination of doubles or bunk-beds. The cabins have plenty of space for all your friends and family with comfortable sleeping spaces, generous storage and ensuite bathrooms. They are well-furnished but have room for guests to bring personal items on board to really make their stay a real home from home experience if they wish. As well as the 6 cabins there are two separate crew cabins (one in each bow) which can be used by the crew if you opt for a skipper. These cabins have individual access via deck hatches and are both equipped with wash basins and bathrooms of their own. This means that you will maintain your privacy throughout your holiday as well as being able to relax whilst leaving the hard work to the crew. The impressive flybridge is easy to access with its wide stairs and handrails. 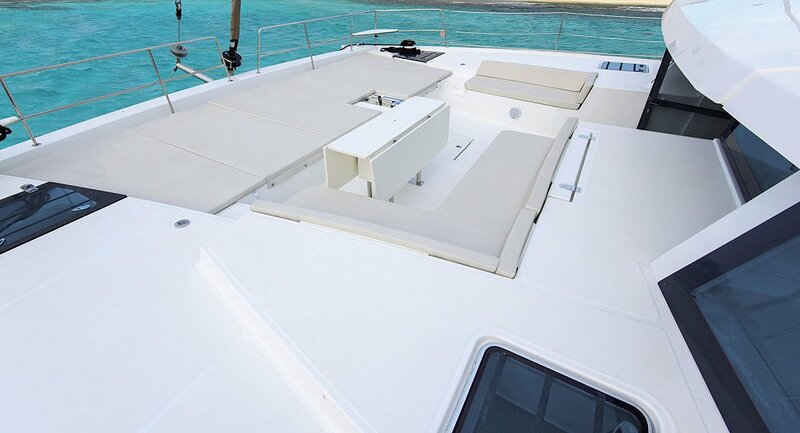 This area has an integral forward deck with steering station plus a huge sunbathing area complete with sun beds, comfortable settees, tables and wet bar/fridge. This is an ideal place for entertaining as you take in the stunning panoramic views or watch the sunsets in the mild evenings. Home comforts are not spared aboard the Bali 5.4 – as well as the restful sleeping and dining areas – you will have the option of air conditioning when the weather is too warm or heating for milder evenings. Both of these are powered by a generator and solar panels which means it is energy efficient too. The fresh water tank holds an impressive 1200 L and of course there is the option of using the onboard water maker if you feel you will need more. The luxurious boat is of supreme quality yet the prices are affordable especially if you are splitting the costs between a few of you. The new Bali catamaran has to be seen to be believed – she has everything you could want for a really special family and friends' sailing holiday as you explore the beautiful Greek Islands together. Designed for up to 12 people, with plenty of space for entertaining indoors or outdoors, the Bali 5.4 has everything you will need for those relaxing, sunbathing days or invigorating party nights as you travel around the island making new memories.